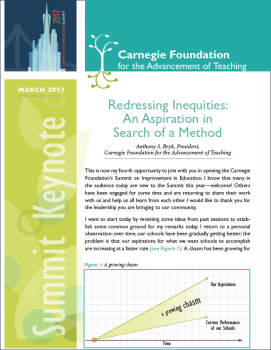 Carnegie President Anthony S. Bryk discussed the promise of networked improvement communities to address educational inequities in his keynote, “Redressing Inequities: An Aspiration in Search of a Method,” at the 2017 Summit on Improvement in Education. This document contains the content of this talk as well as selected slides. The video of this keynote is also available.